I’ve just returned from a great weekend in the vacation hotspot of Huron, SD – the Pheasant Capital of the World. Either way here are some photos to inspire. 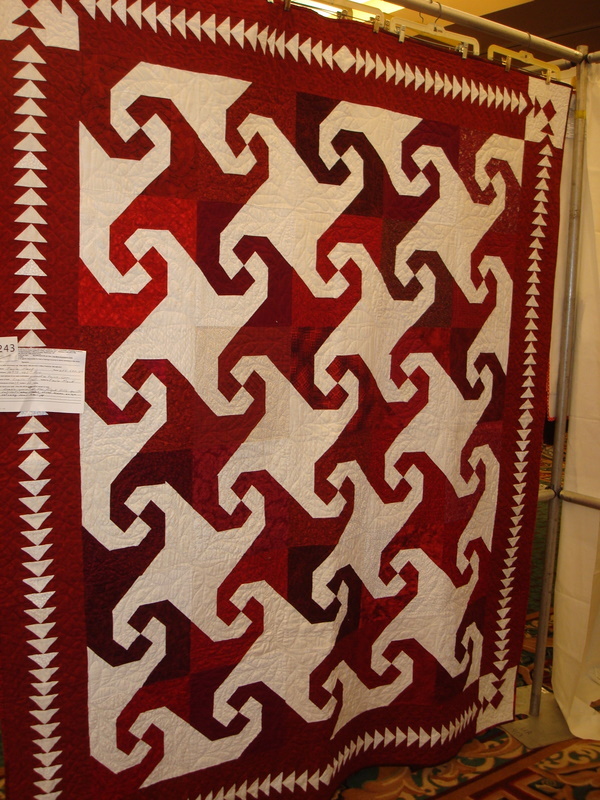 And this red and white Snail’s Trail quilt… what can I say? 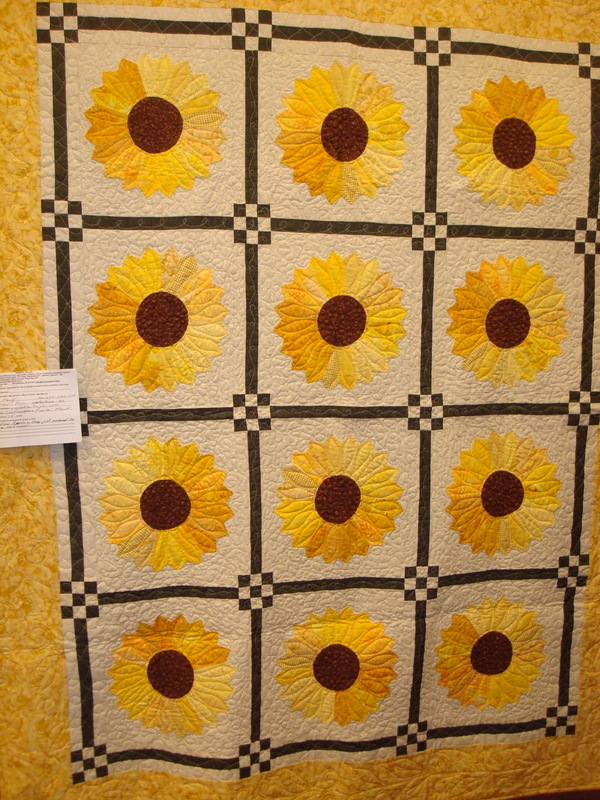 And when I saw this one I immediately ran to the vendors waving my credit card high over my head and bought every bright, sunny, yellow fabric I could find. I have to make one of these for our bed. 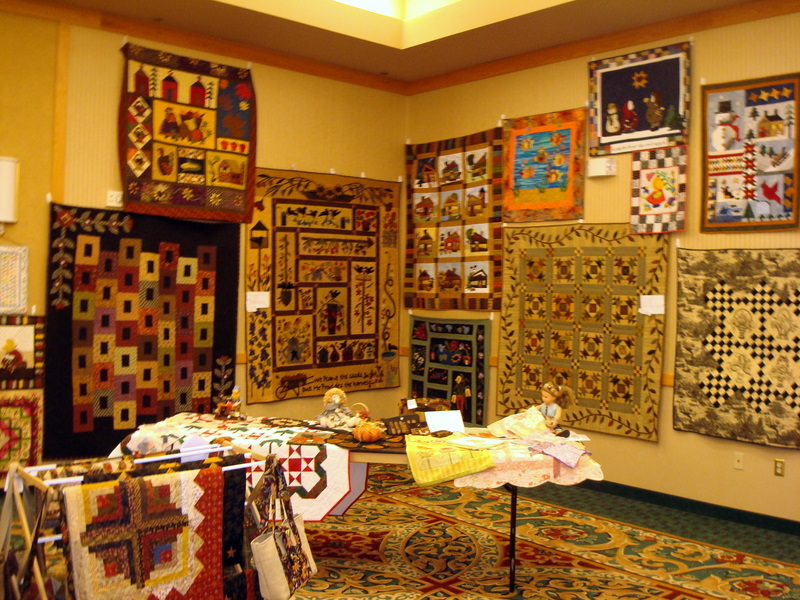 And as if that wasn’t bad enough – Saturday night there was a trunk show – where one quilter shows and tells all about her quilts. This year it was Yvonne Hollenbeck, an award-winning quilter and Cowgirl poet who has more talent in her little finger than 1000 quilters and also a killer sense of humor. I love this lady! 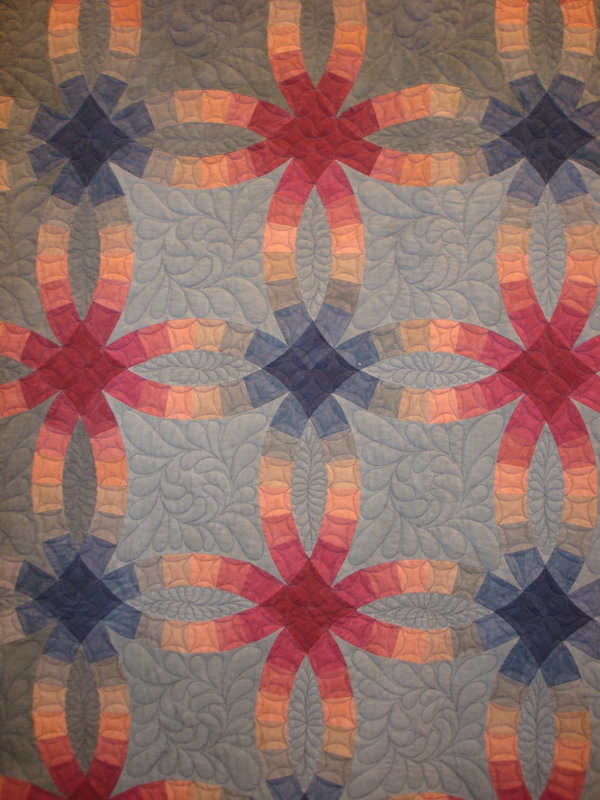 She spoke about the quilts that were made by her Great Grandmother, Grandmother, Mother and Aunties. The quilts were stunning and the stories truly touching. Its been about 7 years since I have done any real quilting and all it took was one trip to the state guild to make me totally ‘fall off the wagon’. Yep, it’s time to finish up my quilting room. I will take time to play. 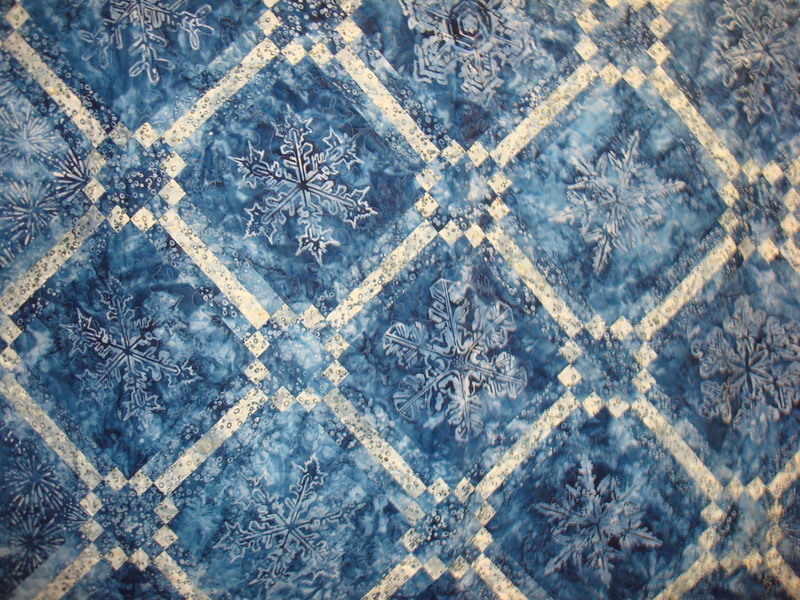 I will make beautiful quilts for every bed in the house. And I will attend every quilt event and fabric store within a 500 mile radius. 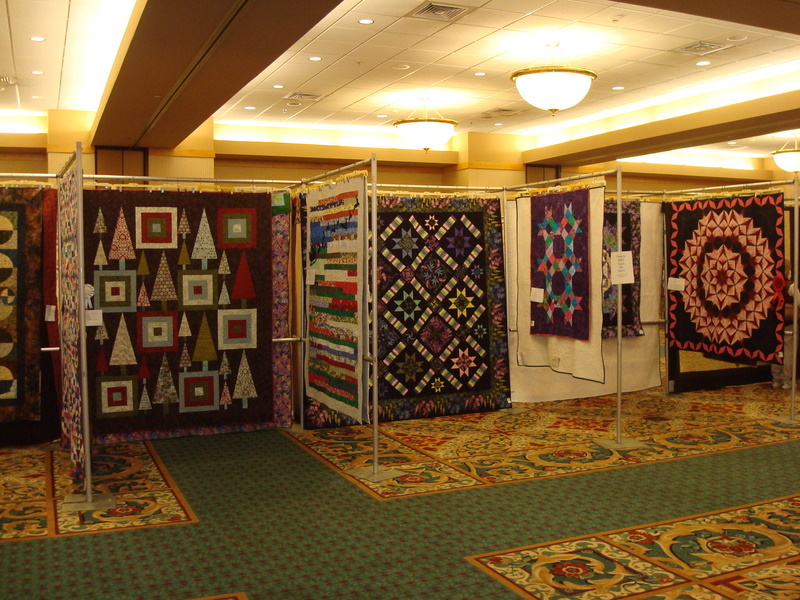 Look out quilt world – I”m back!!! 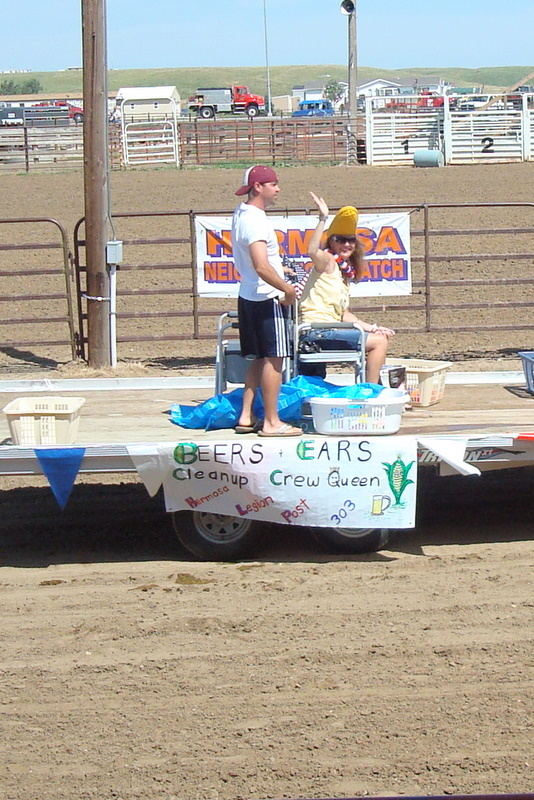 One of my all time favorite events of the Custer County Fair is the annual ‘Beers & Ears’. 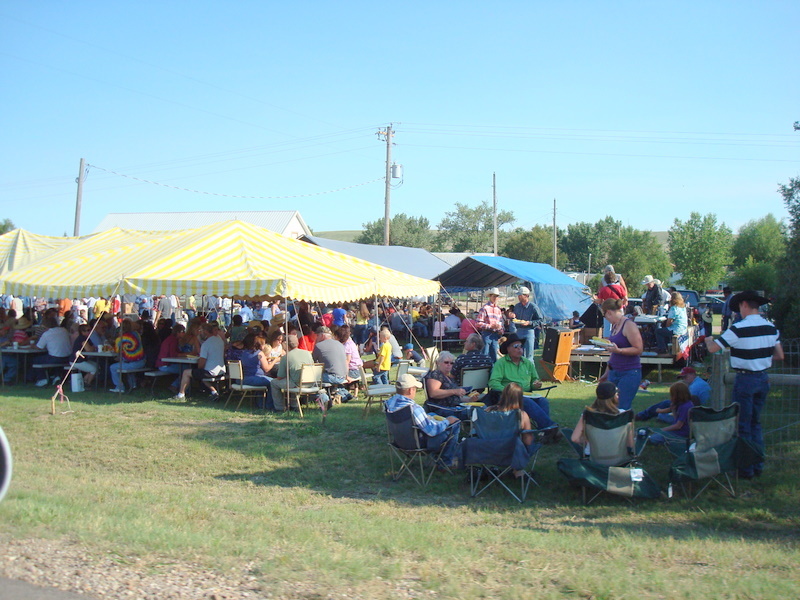 It is hosted by the local VFW Post 303 and is jam-packed with great food, good music and a huge crowd. As far as I’m concerned, it is the social event of the season and here’s a few photos to prove it. Here’s the line waiting to get in. 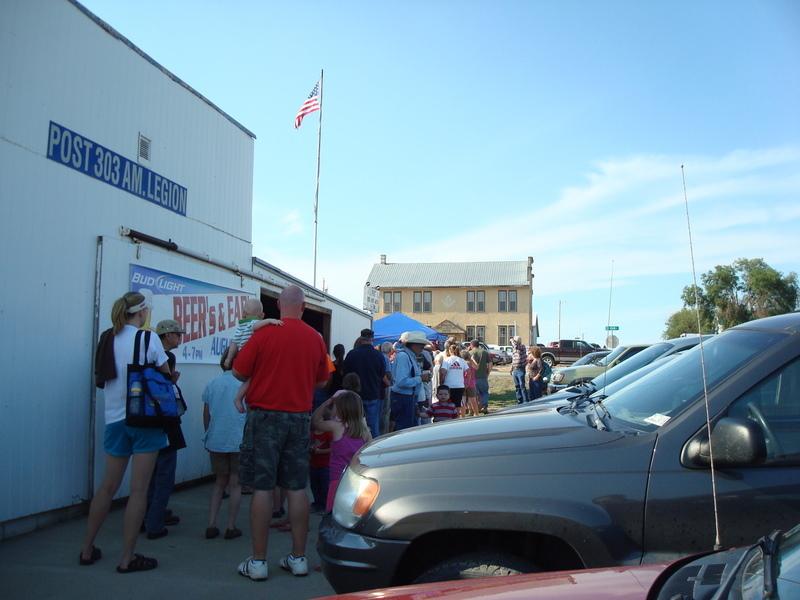 This is the only time you will ever see people lined up in Hermosa, SD. 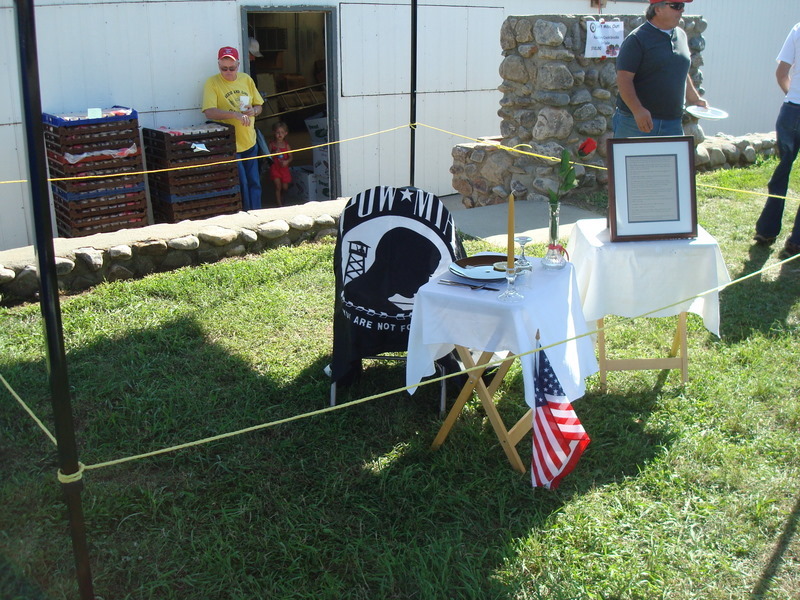 It is loads of fun but we never forget the ones who can’t be there – POW’s & MIA’s and also the local heroes who are serving in the Armed Forces today. Hermosa has a population of 351 and I would guess everyone plus a bunch of relatives, friends and tourists show up for Beers & Ears every year. This year they had 4 tents set up and each of them was packed to overflowing. I remember one year it was raining hard. The skies opened up and dumped buckets of rain just as people were starting through the line. The wind was blowing from the north and by the time we got our food the only available seats were on the side with the rain running down your back. The funny thing was most of those seats were all ready taken by ranchers and farmers who were so happy to see rain that they didn’t care! It had been so dry for so long that rain was a blessing even if it came during dinner. Of course we turned our backs to the wind and sat down with them. 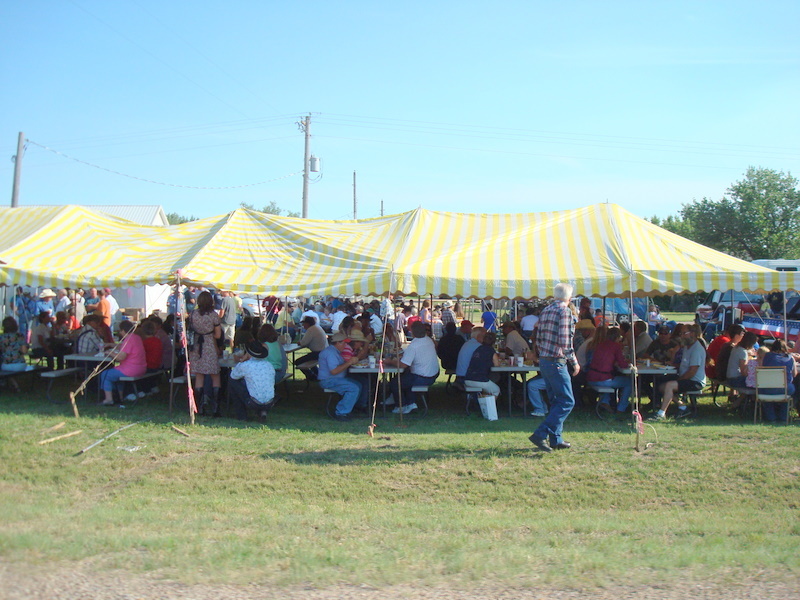 Everyone on our side of the tables was soaked to the skin but we were still laughing and eating and telling stories – it was great! 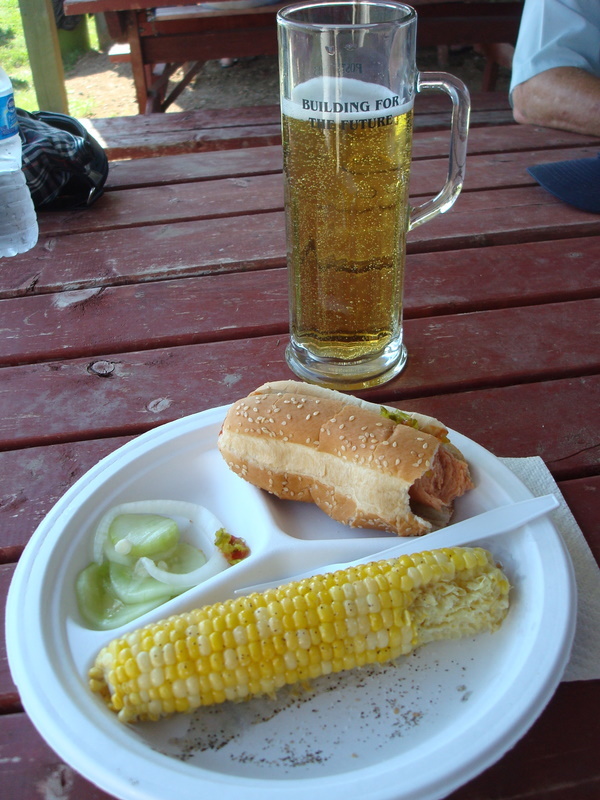 The menu is simple – for $7.00 you get as many brats as you want (with all the fixings), a salad of locally grown cucumbers and onions in a vinegar dressing & all the sweet corn you can possibly eat. This year they cooked around 80 bushels of corn and I’m betting they didn’t have much left over. The beer is extra because I’m afraid they would go broke with this crowd if they didn’t charge by the glass! Check out my official Beers and Ears Mug. The VFW sells these huge mugs to raise money for their building fund. I’m not sure if they are repairing the building they have or hope to someday build a new one. Either way I had to have one. It sits in the cupboard all year-long but I wouldn’t think of going to the fair without it. All the hard-core Beers and Ears fans have one. Everyone from the VFW pitches in and helps and in all the years I’ve gone to Beers & Ears I don’t remember ever hearing anyone complain or any fights breaking out. Everyone is there for fun. They even crown a Beers & Ears Queen! It is always one of the ladies who helps out. She “reigns over the clean up crew, adding a touch of class to what would otherwise be a vulgar event”. They say that every year as she waves from her throne at the parade on Sunday morning. Notice the corn cob crown and her body-guard. Actually, I think he was just there to throw candy to the kids. So, if you’re ever near Hermosa, SD in mid August and you see a sign out on the highway announcing the County Fair be sure to turn in and have a look. And if you happen to be there on Saturday afternoon, main street will be filled with vehicles and people. And if you smell the aroma of brats and sweet corn – don’t you dare drive by. Just get in line for one of the best meals you’ll ever have. It doesn’t matter if you have Cowboy boots or flip-flops on, I guarantee you’ll have a great time! 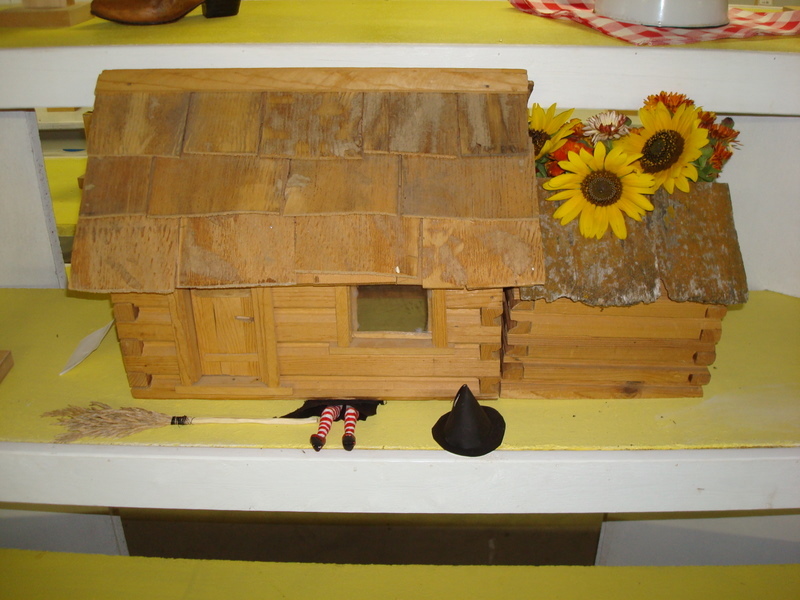 I promised you pictures of the County Fair and here are some of my favorites. 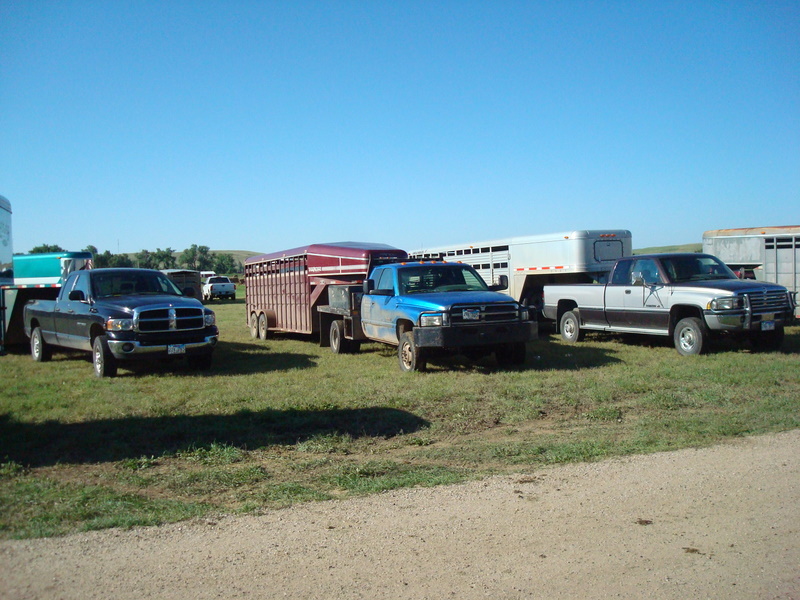 pickups and horse trailers as far as the eye can see. 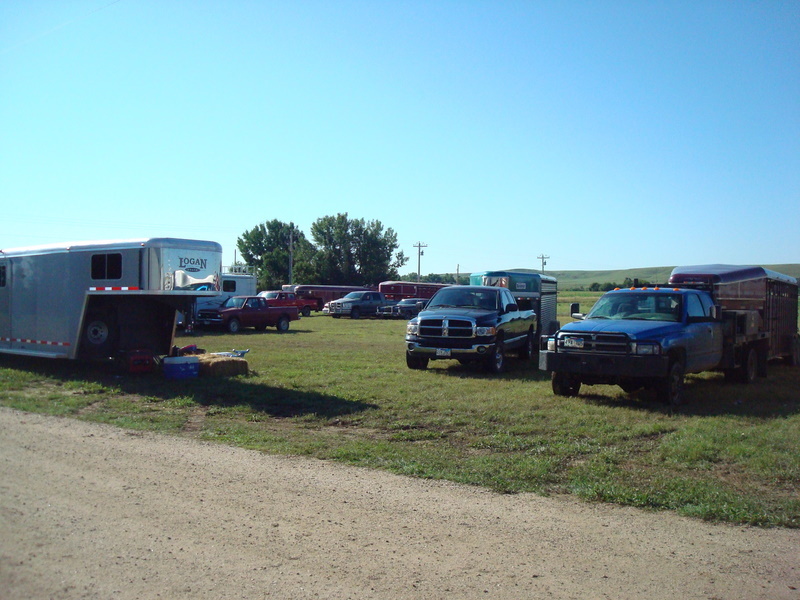 And of course where there are pickups and horse trailers you will also find cowboys. 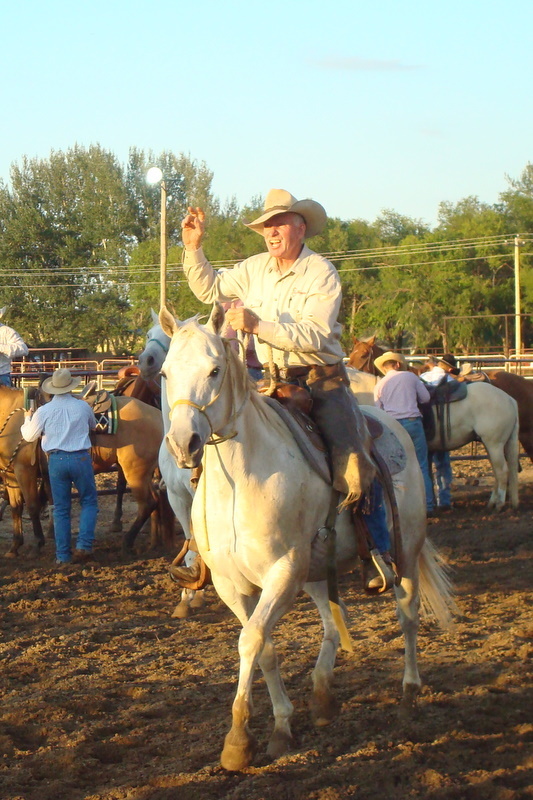 This is our neighbor Clayton leading his team to victory at the Ranch Rodeo. Yikes!!! 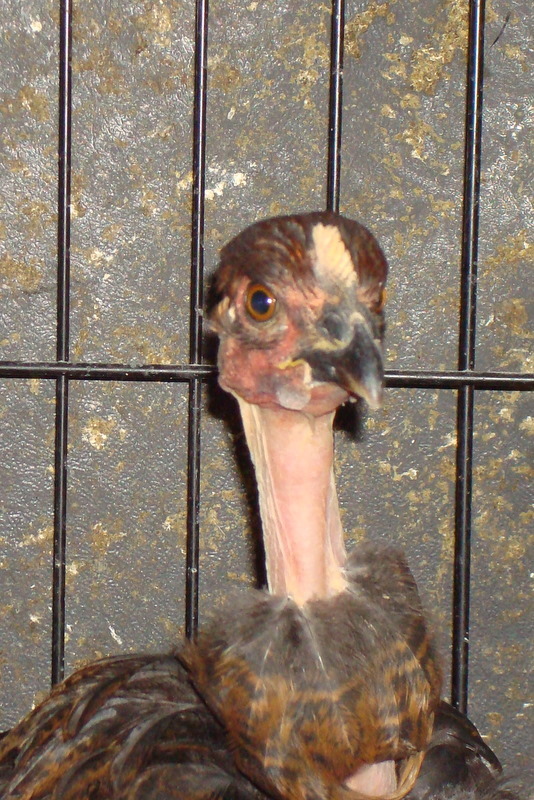 Great gobs of poultry poo kid, what happened to your chicken? 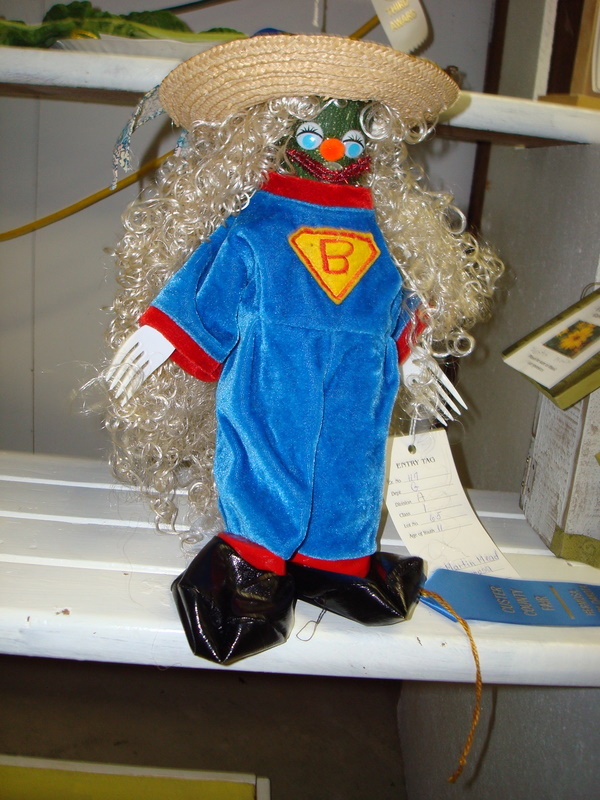 Believe me, if it’s weird and wacky you will find it at the fair. I just love the creativity of ranch kids – check this out. This was my all-time favorite entry – ever!!! 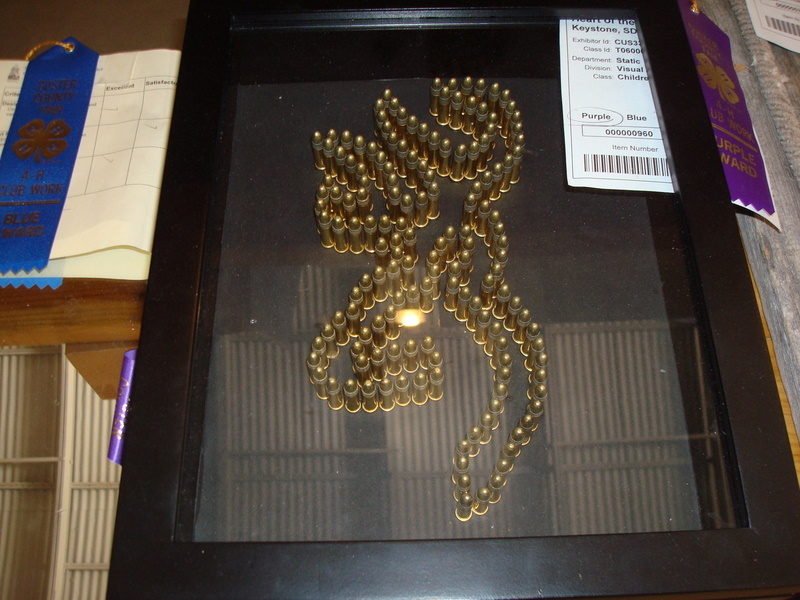 Artwork made from live ammunition. I bet Martha Stewart never thought of that. Yes, those are loaded .22 shells. You have to admit it sure beats the hell out of a velvet Elvis painting doesn’t it? Notice I even got a nice little glare on the glass for the eyeball from the overhead lights – Cool. I just love 4-H kids!!! Then I was off to the Horticulture building where I found this. 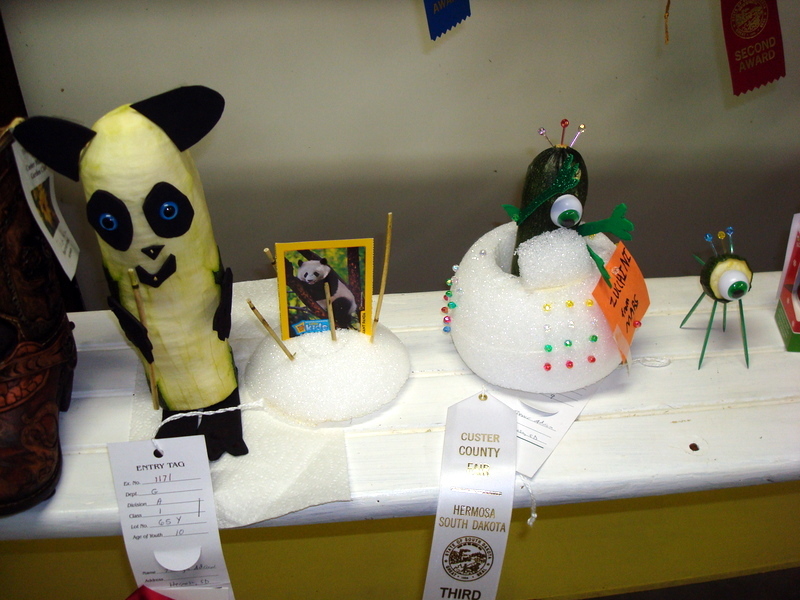 Can you believe there were only 3 entries in the ‘Dress a Zucchini’ category? There would have been more but we have been hit by some really bad hail storms and most of the zucchini were mush. The one above was awarded the blue ribbon followed closely by these two in 2nd and 3rd place. Just incase you can’t tell from the photo, that’s a very rare and endangered Zucchini Panda on the left and a Space Alien Zucchini with his trusty one-eyed Space Dog. I thought they all deserved blue ribbons. Along with this guy – another great 4-H kid. This is an 11-year-old boy with his very own team of oxen. Now, how many kids do you know can say that? There were also people with really big horses. 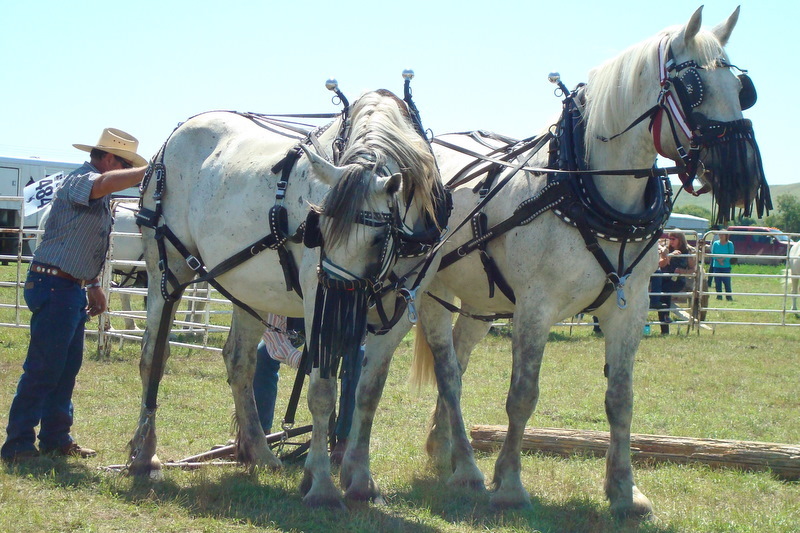 This year they had a competition with 9 teams of ‘gentle giants’ like this entered . They had several different events like log pulling, an obsticale course and they even played basket ball. 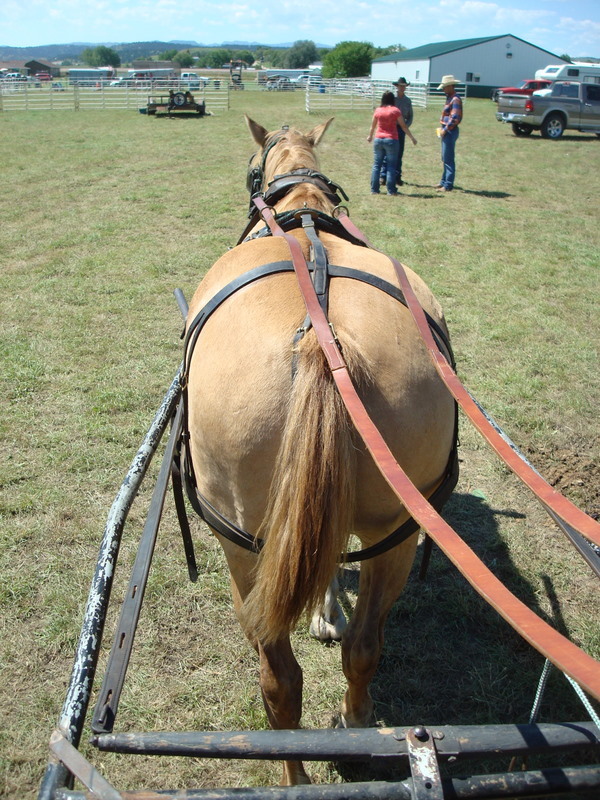 She’s aiming for the barrel right behind the wagon and she almost made it. I loved the horses and was amazed at all the things they could do. 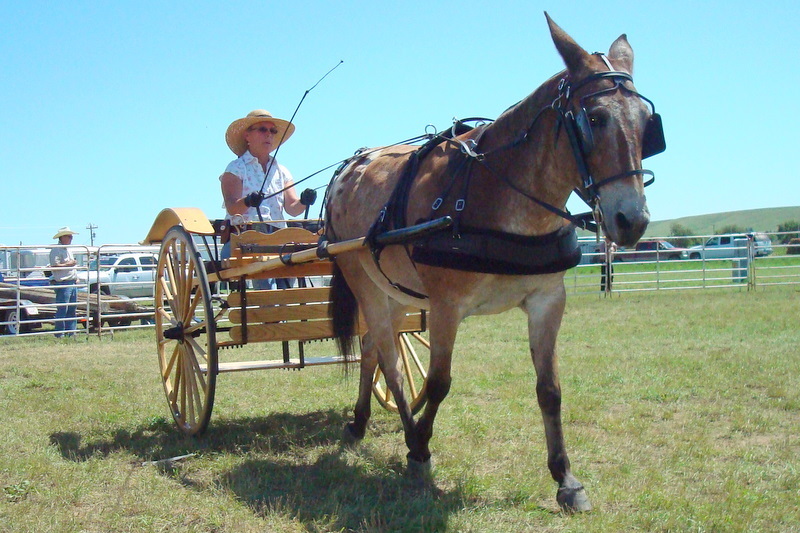 Best of all I got a ride in this beautiful buggy with Alice and her mule Belle Star. To prove I got a ride, here’s the view from the front seat. There – now don’t you feel better? And Belle was such a sweetie. Then there was David and his horse Killer. 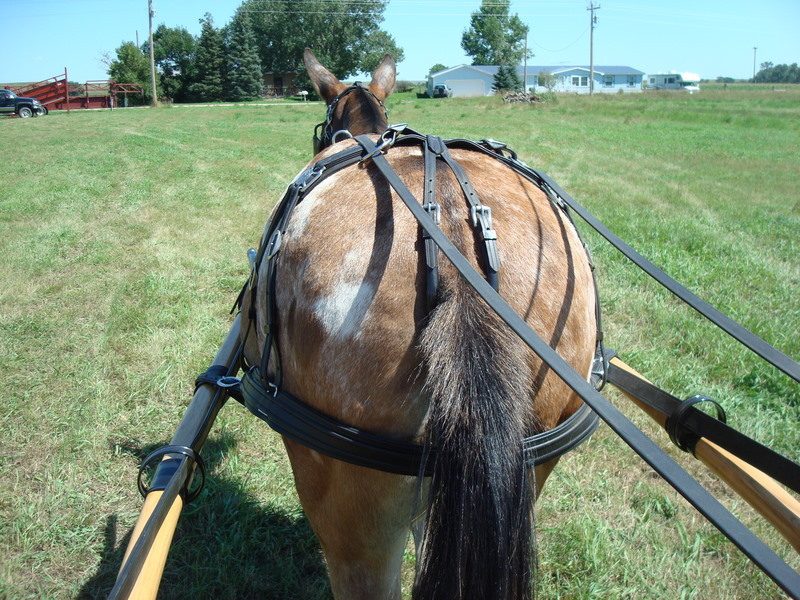 Not only did I get a ride in the wagon but I even got to drive Killer! I’m told there are very few people who have had this honor – it’s a very elite group. I think we should have T-shirts printed. Then there was my favorite flower arrangement. 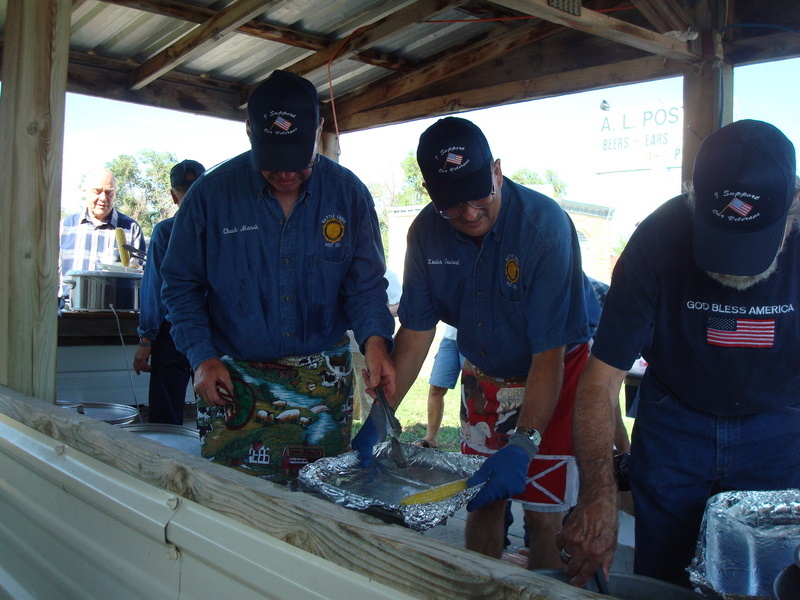 And last but not least – my favorite meal – Beers and Ears at the local VFW. I went curling with my sister and this time my Hubby, my Dad and my nephew went with us. I know what your thinking – isn’t it sweet that those guys all wanted to come and watch us curl because we’ve obviously gotten so good at curling that the men in our lives are sooooo proud of us and they just know that someday we will be chosen to represent the United States of America on the Olympic Curling team and they wanted and even begged to go with us just so they could show us the love and support we need to help us in our quest for Olympic gold. 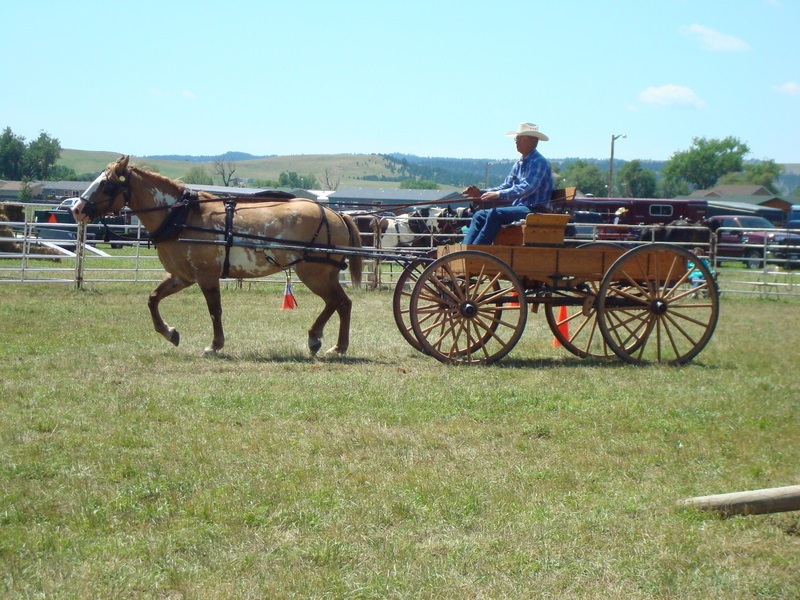 That would have been cool but really they just wanted to ride with us so we could drop them off at the Black Hills Stock Show. Thanks a lot guys for crushing our gold metal curling dreams. Oh well, I really can’t blame them because I wanted to go to the Stock Show too. 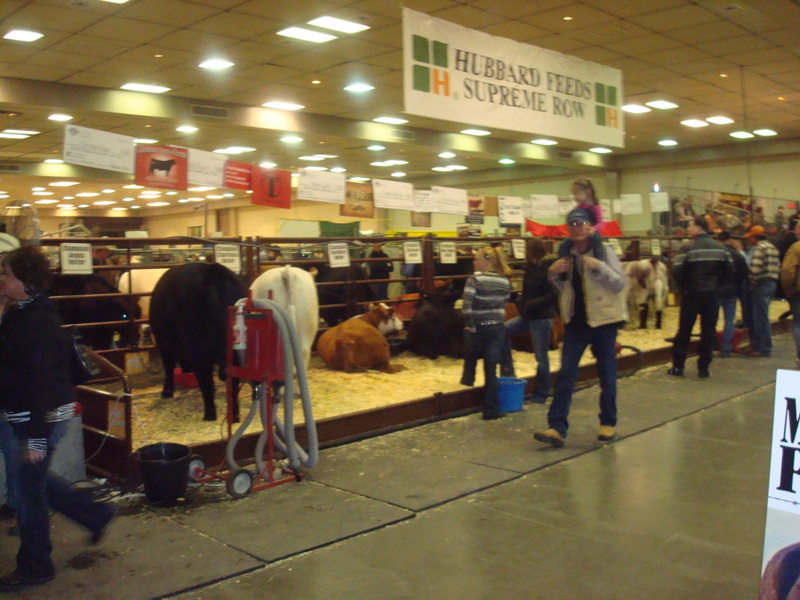 If you’ve never been to a Stock Show what are you waiting for? Make plans now to go to the next one you can. Stock shows are full of all kinds of interesting stuff like lots and lots of cute cowboys in tight Wrangler jeans and bunches of beautiful cowgirls all dolled up in fantastic western wear that is ‘all about the bling’ right now. I’m sorry to say I’m not one of them. I’m one of the tough old ranchers wives who bought a new pair of jeans (Wrangler cowboy cut) for the occasion and threw on the stretched-out turtle neck shirt (because it’s damn cold outside) and the wool vest (half price last spring at the feed store) and forgot to put on any makeup (Makeup? Do I actually own any makeup?) or even earrings. I did tie on a silk scarf to spiff up the outfit a bit but frankly I’m lucky most days if I get my hair combed. I’ve always been about 15 years behind when it comes to fashion but it’s still fun to check out all the clothes at the venders booths. And, Boy-Howdy, did they have venders! Even if you don’t buy a single thing there is so much to see. For one thing, there’s really big Tonka toys inside the building. 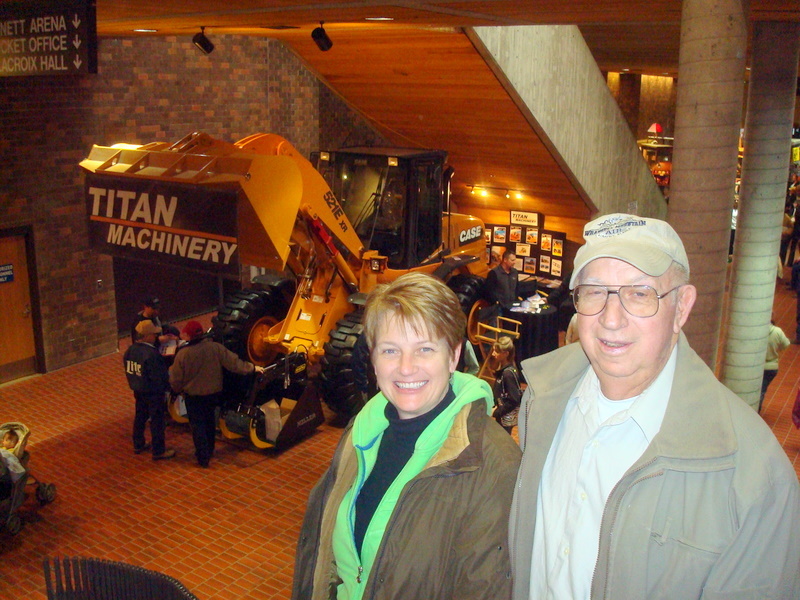 Here’s my sister, our Dad and a brand new loader. 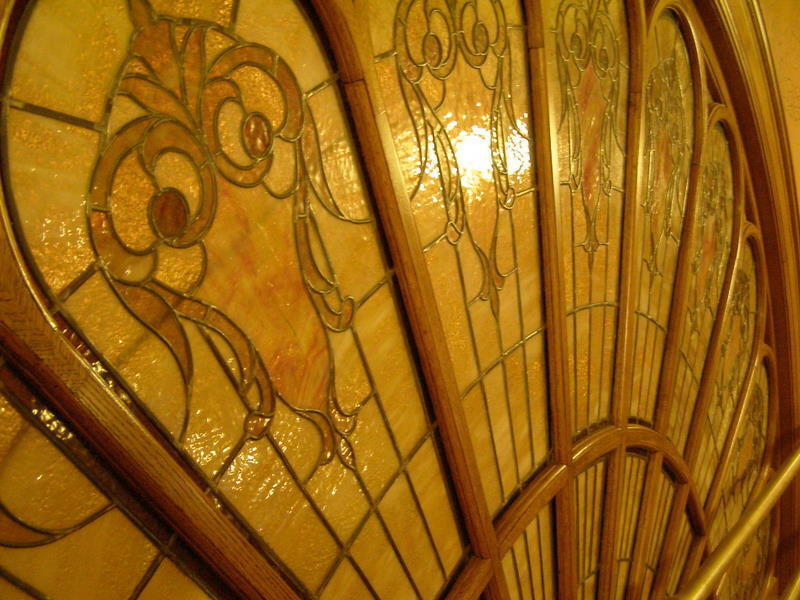 There wasn’t even a tray under it to catch leaking oil – I was so impressed! And did you know that if you ask really nice and say ‘Please’ the guys in charge of the booth will let you climb up into the cab and pretend you are really serious about buying it? Ha! That thing cost more than our house. But then, as soon as they realize you don’t have any money and they give up and go talk to someone else you can bounce in the seat and make engine noises with your mouth and spit all over the inside of the windshield. Not that I would do such a thing. I’m much too dignified and refined to do such a thing. I’ve really grown up a lot since last year – haven’t I? The truth is my knees were still killing me from curling last weekend. I didn’t think I could even climb up in there. 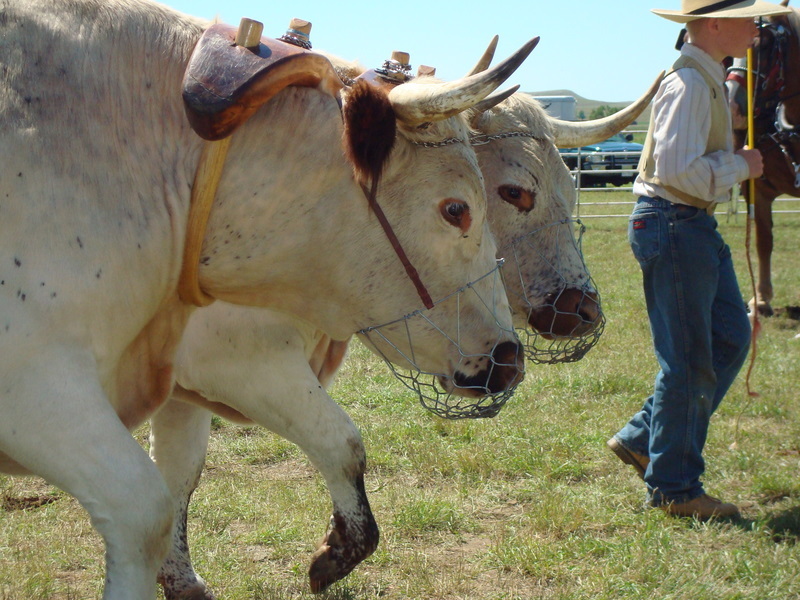 After we checked out the big equipment we went to see the cattle – every Stock Show has them – or else it wouldn’t really be a ‘Stock’ Show, would it? Just look how pretty and well-behaved they are. Not a cow pie or speck of manure anywhere. It takes many hours of work and dedication to train your cattle to do this stuff and look this way. Our cows don’t look like this. Our cows leave cow pies everywhere they go and usually they have lots and lots of manure smeared all over them. I’m pretty sure that if you tied one of our cows to that pretty little fence and tried to comb and blow dry her she would freak out! You would probably get stomped into the ground or at the very least she would blow snot all over you before ripping out the fence and dragging it and all the other cows tied to it on a wild-west tour of the entire stock show. 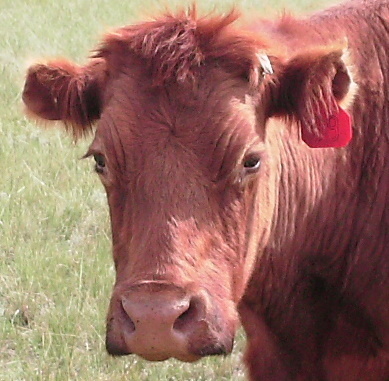 We just don’t have diva cows – ours all blow snot. Besides, if we brought one of our cows I’m afraid they wouldn’t place very well in the BBP (Bovine Beauty Pagent). She’s a nice mellow momma cow but Damn Girlfriend! – that’s a face only a rancher could love. Don’t worry honey, we love ya! But talk about divas – check out these boots. 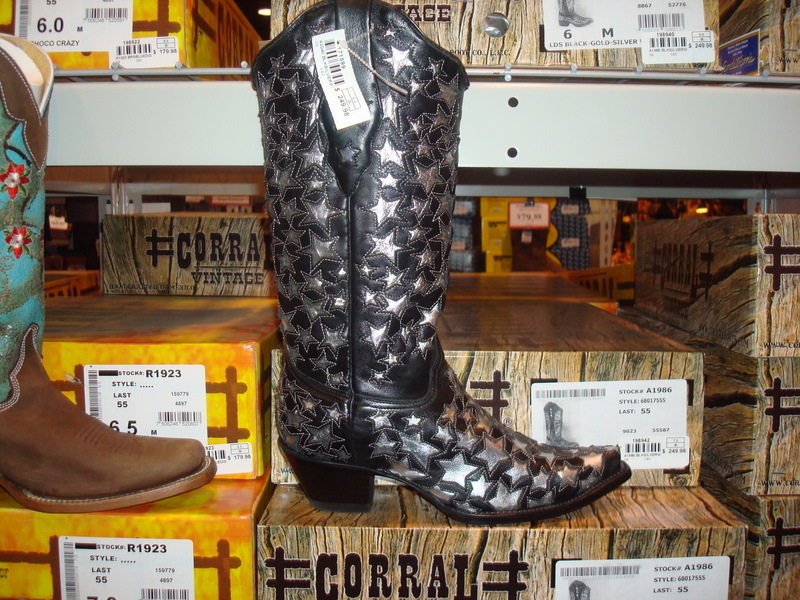 Boots like this will make you want to sing. My sister did. Go ahead, you can sing along. No body will hear you. Yes, people were looking at us strangely and keeping their children far, far away from us and the guys were pretending they didn’t know who we were but we did have fun. I can’t wait for next year! 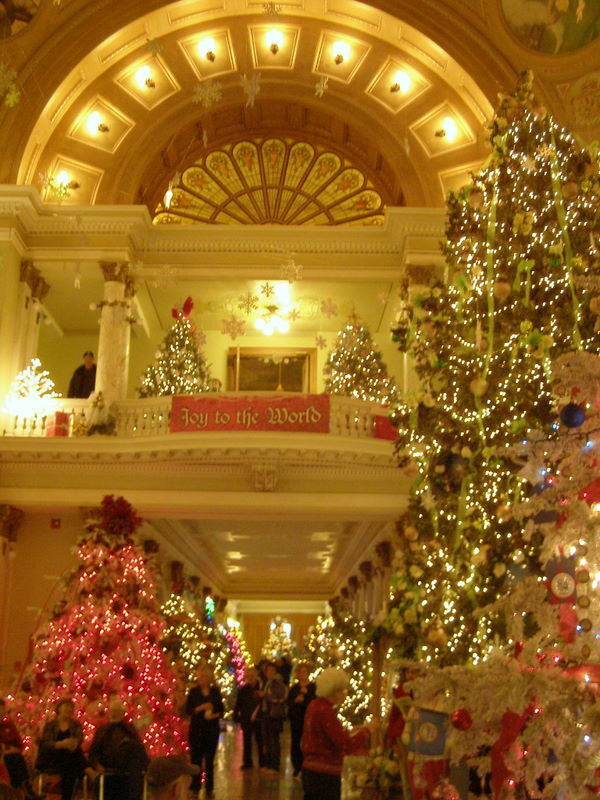 I love to go to the South Dakota State Capital building at Christmas! 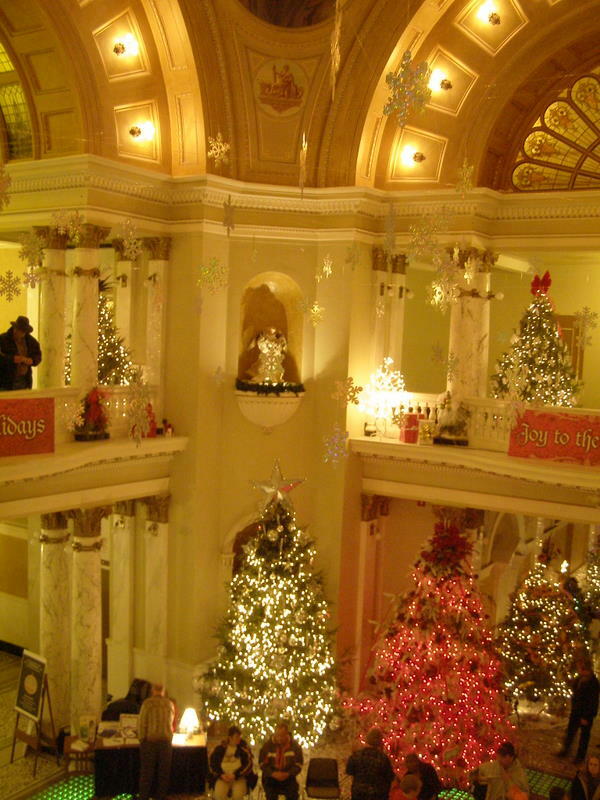 Every year, from mid November till the end of December our capital is decked out with over 100 decorated Christmas trees. And the best part is that anyone can decorate a tree! You just have to fill out an application. Our state capital is in Pierre – pretty much, smack-dab in the middle of the state. The trees (no artificial ones are allowed) and the lights are supplied by the State. They are set up and ready to decorate when you arrive. 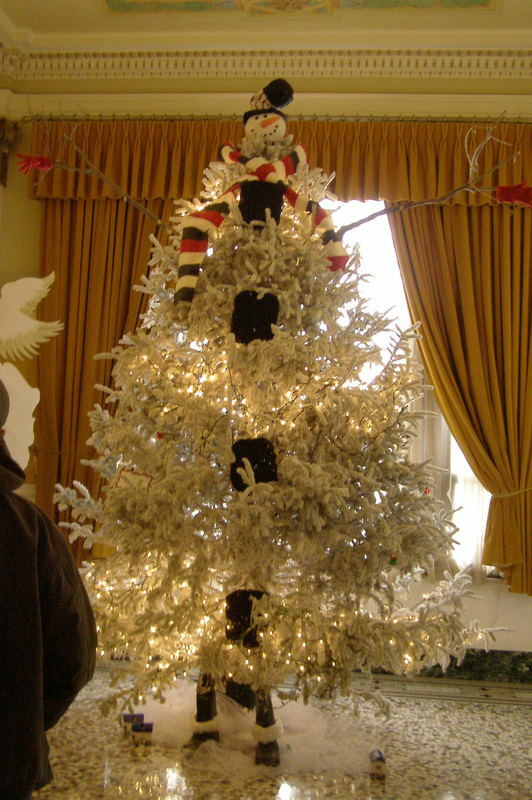 Each tree is decorated by a different club, organization, buisness, family, farm or ranch. Some have specific themes and most have wonderful hand-made ornaments. Some of my favorite trees have been the ones decorated by local farms and ranches who are celebrating over 100 years. 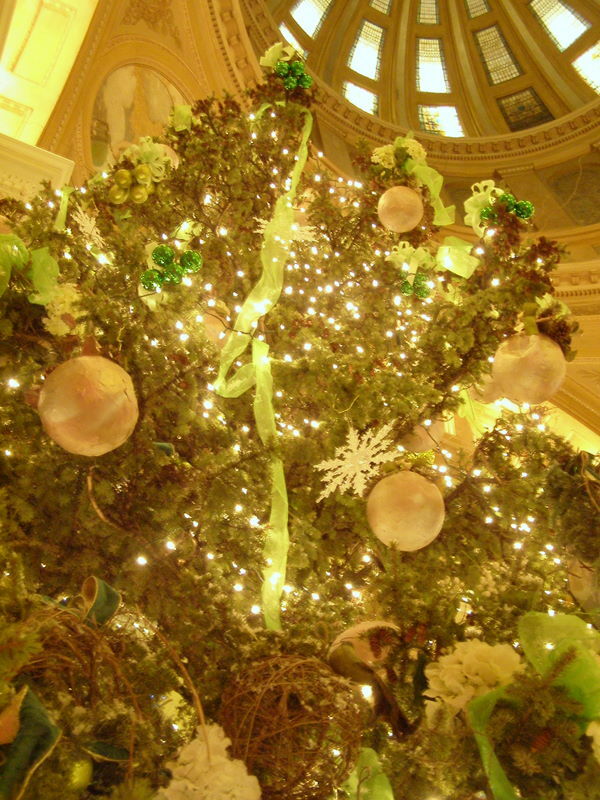 The largest tree in the rotunda of the Capital is between 25 and 30 feet tall. Last year it was decorated by the South Dakota Florist’s Association. 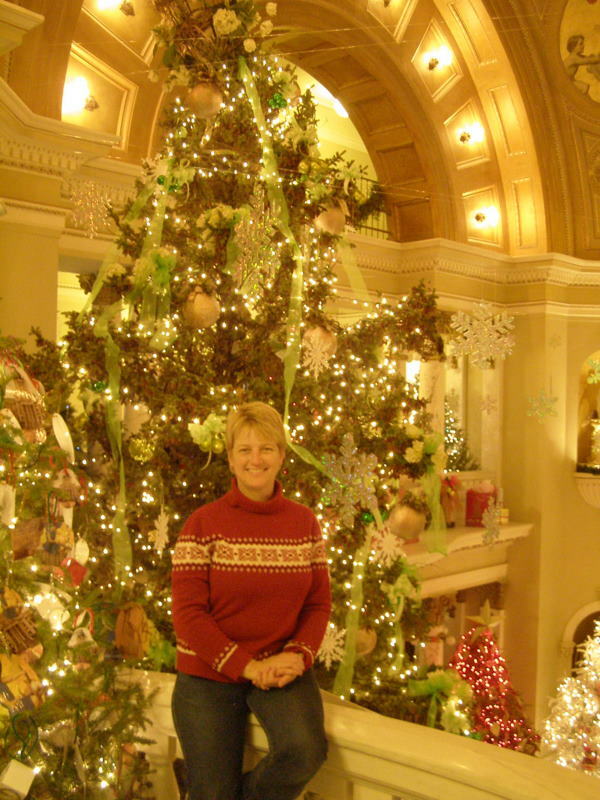 Here’s my sister, the florist – one of many who helped decorate it. I have never been there for the decorating but I’ve heard it’s a lot of fun. I usually show up after its been transformed into a winter wonderland (when the work is done – Hee Hee!). 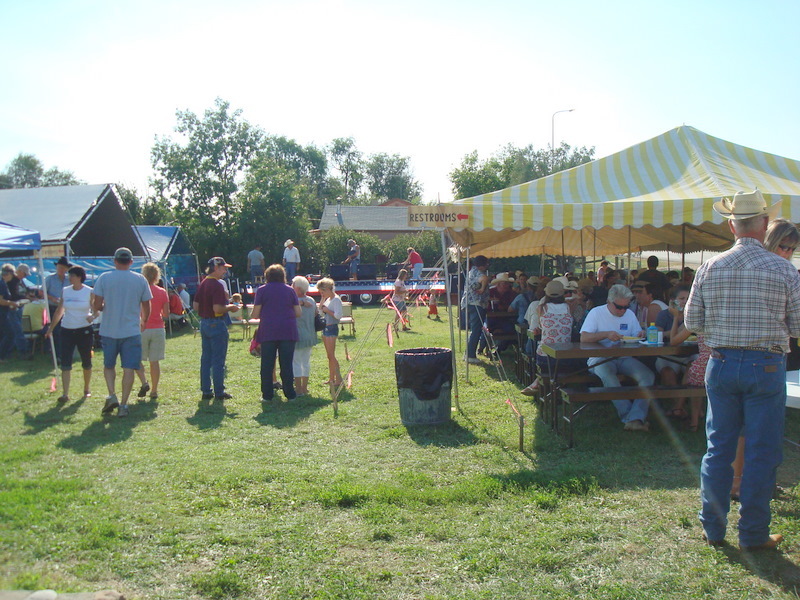 All season they have different events and a variety of entertainment – especially on the weekends. They have choirs and vocalists and if you get there on the right day the Governor himself will serve you a piece of pie. Unfortunately, I have never made it for pie day – maybe next year. Of course, I love old capital buildings anyway. 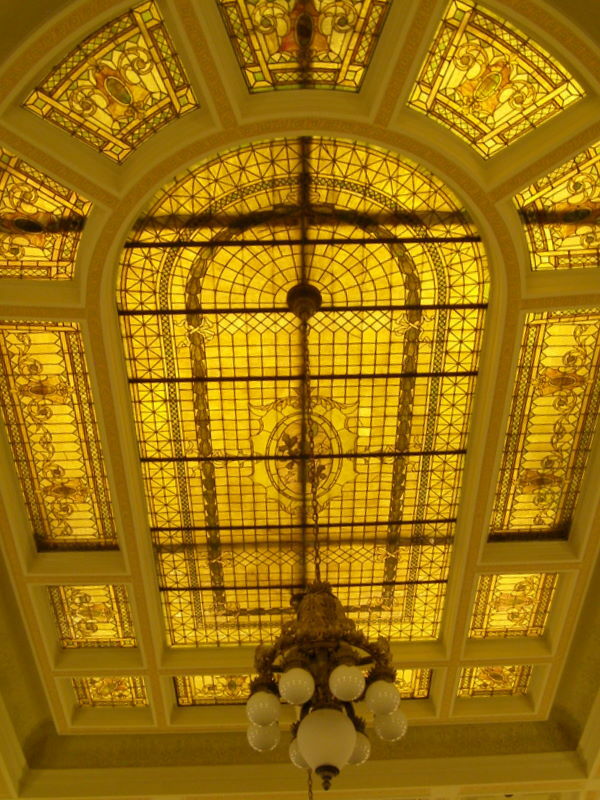 The marble pillars and stained glass are impressive. 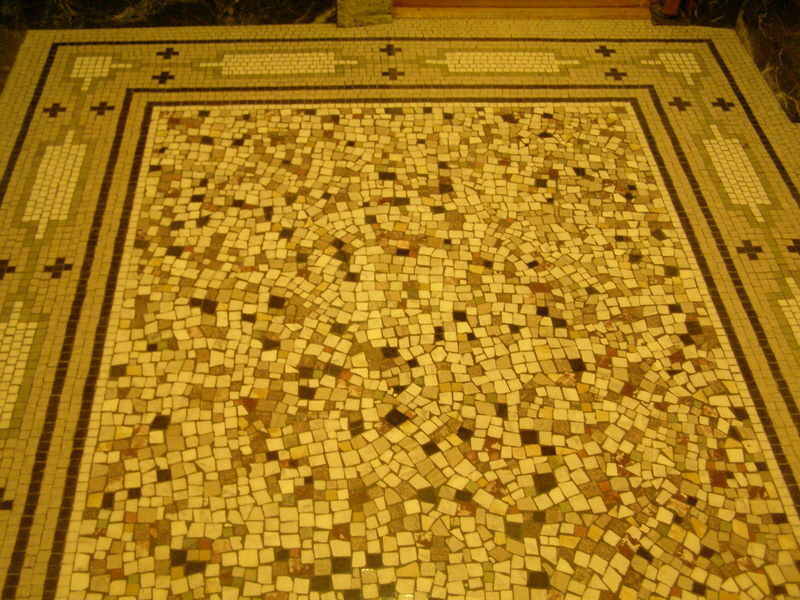 And I love the floors of our capital building. I don’t know how they make them but I love it!!! I want these floors in my house. I didn’t make it to this years display – these photos are from 2009 but I’m sure this year was just as beautiful. I don’t know if other states do this but check it out and if they don’t I’d like to invite you to South Dakota. 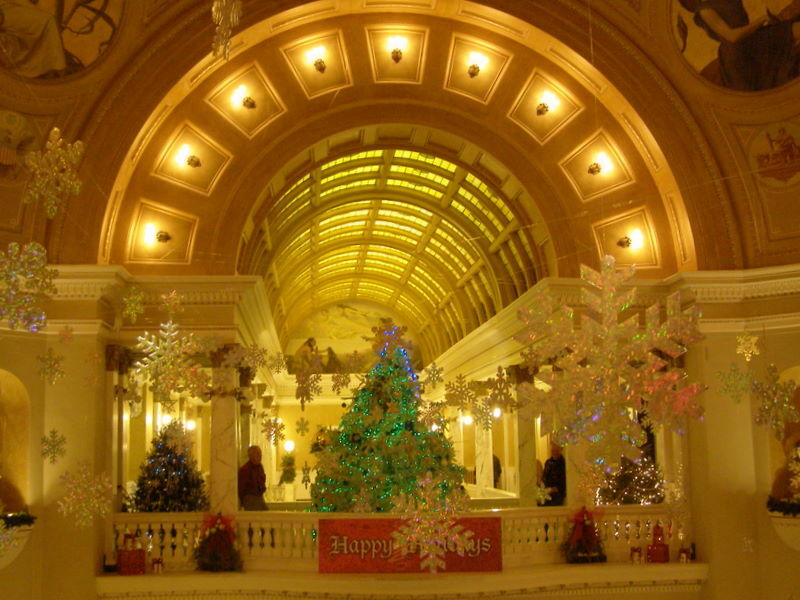 The Pierre Chamber of Commerce has information about the displays on their website. 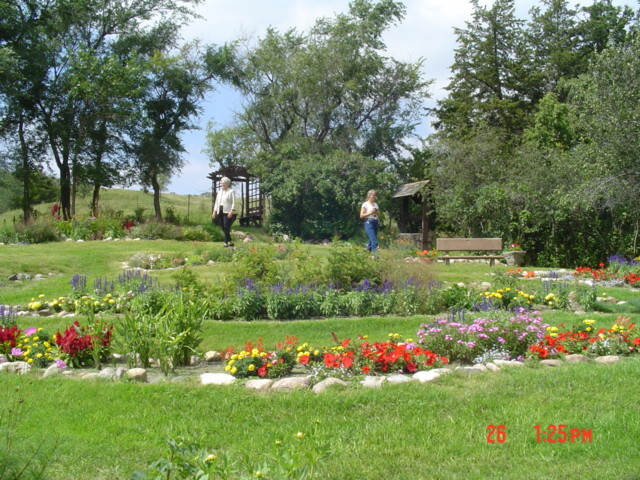 I’ve told you about out Garden Club trip to Sioux Falls but I didn’t even mention the last stop on our trip – the wonderful Shakespeare Garden at Wessington Springs, SD. 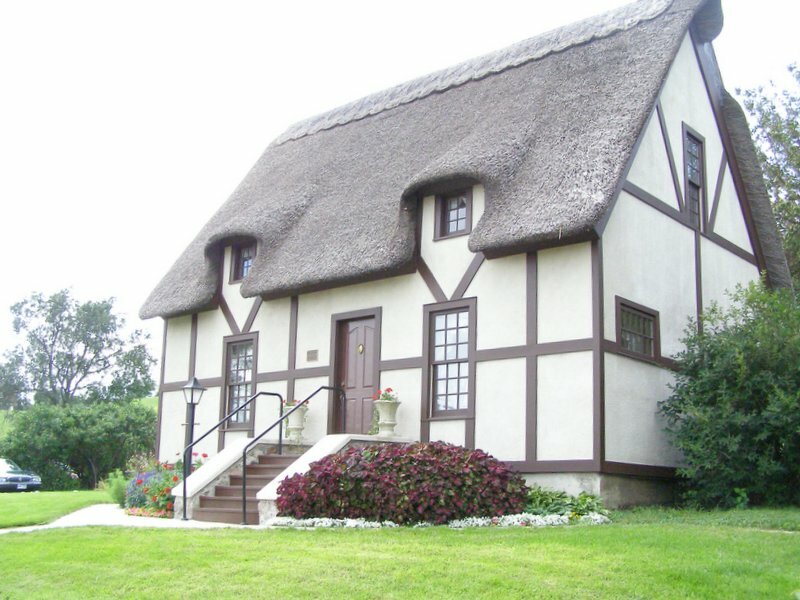 It is amazing to me that I have traveled past the small town of Wessington Springs so many, many, many times in my life and had never even heard of the garden or the beautiful thatched roof cottage until I started planning the garden club trip. How could this happen? 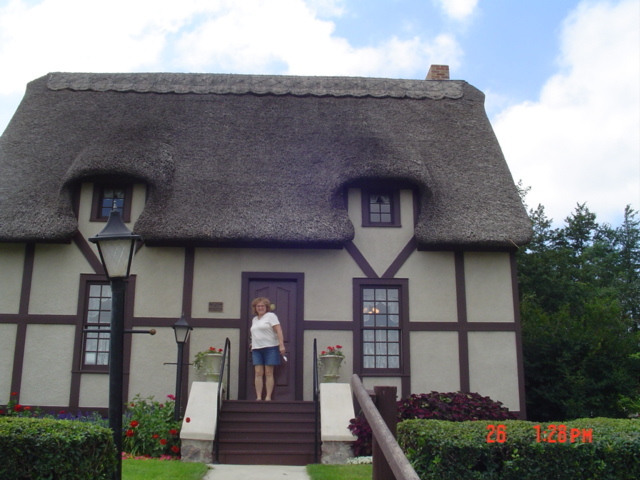 I mean really – this is the only thatched-roof building in the whole flipping state! But it’s true. Thankgoodness for the internet or I would have missed it entirely and probably gone to my grave never realizing it was there. 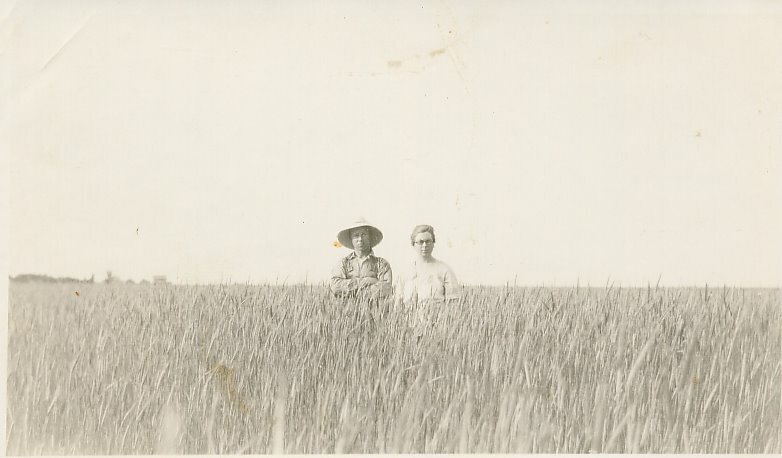 It all started in 1926 when Mrs. Emma Shay and her husband, Clark W. Shay were both professors at the Wessington Springs Seminary. Emma was an English Literature teacher and more than anything she wanted to travel to England and learn everything about the area and the writers who called it home. She knew it would make her a better teacher but she needed $1,000.00 to make her dream a reality. She borrowed the money from the Seminary with the understanding that she would keep a journal of her travels and also gather flowers, leaves or whatever she could get her hands on from the grounds of the homes of her beloved English authors. When she returned home these pressed and preserved treasures would be used to make ‘portfolios’ to sell and thereby repay her debt. And she did it! 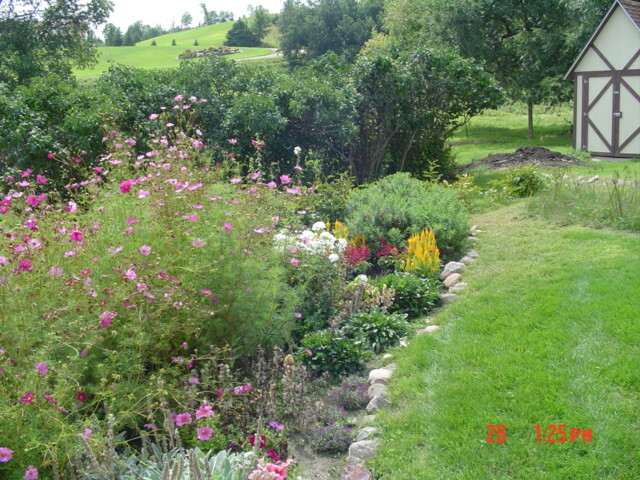 She traveled to England alone and saw the homes of the authors whose writings she had always loved and when she returned to her quiet little home in South Dakota she worked hard and paid back the money then promptly set to work (with the help of her husband and students) to build a garden filled with the flowers and plants Shakespeare had written about in his plays. When Emma and Clark retired in 1932 they began work on a cottage designed from a postcard of the original Anne Hathaway Cottage at Stratford-on-Avon. I want to live here (so does Sue). 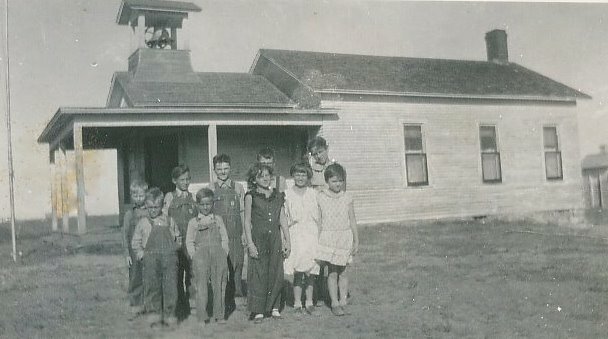 The college was closed in 1964 and the buildings demolished in 1970 – except for the cottage which was privately owned at the time. In 1989 the Shakespeare Garden Society was established to purchase, restore and take care of this wonderful place and the rest is history. 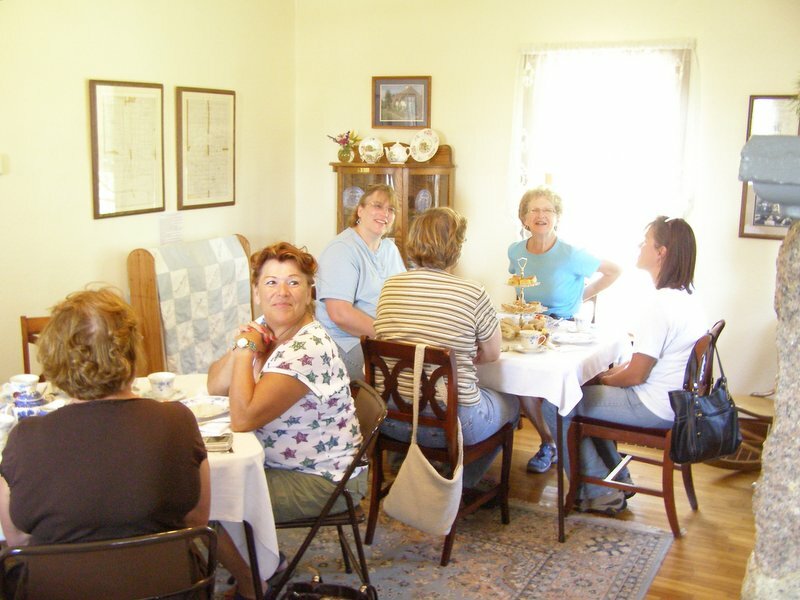 Our garden club had arranged a group tour and English tea complete with fresh scones hot from the oven. 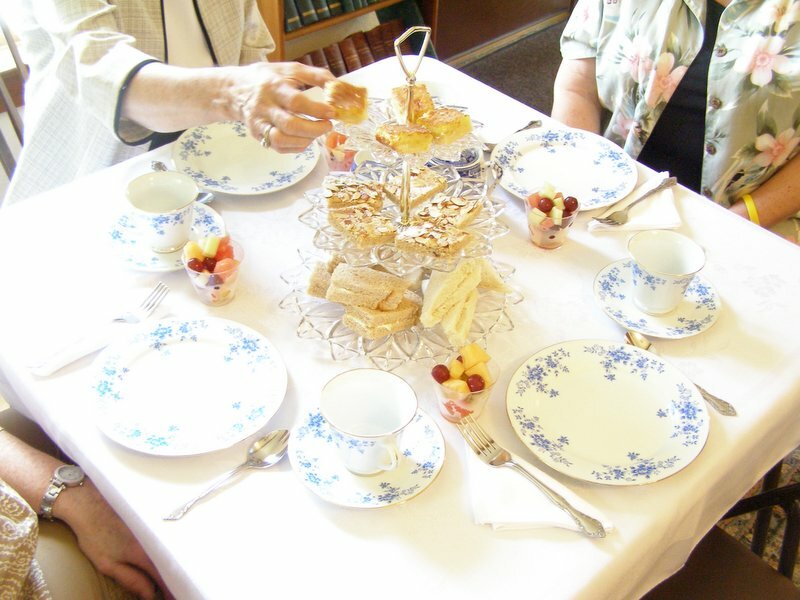 We thoroughly enjoyed ourselves and felt like little girls playing tea party. If your planning a trip through South Dakota be sure to stop by and check it out. Their web site is: www.shakespeargarden.org It gives you scheduals and upcoming events. Just makes you want a ‘spot o’ tea’ doesn’t it?